This is a comprehensive employment contract for casual workers that complies with The Employment (Miscellaneous Provisions) Act 2018. Zero hours are no longer allowed by law. Instead, this agreement provides the employee with a range of hours for which he or she is expected to work. It also covers all the legal requirements for information to be given to an employee. This casual employment contract covers all legal requirements for information to be given to an employee. The Employment (Miscellaneous Provisions) Act 2018 has amended the Organisation and Working Time Act 1997 by removing the phrase "zero hours practice". An employer no longer is able to engage an employee on a contract where the stated contracted hours are zero. This contract complies with that law. In the agreement you provide the employee with a band of hours, with an option to call him or her as necessary. The document also acts as a written statement of terms of the agreement, which, provided you have the employee sign it within 5 days of starting, allows you to comply with the requirement to provide contractual information. The document is a superb framework for fair and full protection of the employer and compliance with legal and organisational requirements. Use of plain English makes editing easy and allows it to be understood by all parties. It is similar to our standard employment contract - just as comprehensive - but edited for application to casual work. It provides pro-rata holidays and sickness benefits. Specifics for different jobs, such as duties and training provision, can be added easily if required, either within the existing text, or by reference to a job description. It is strong on protection of the employer's intellectual property and confidential information. 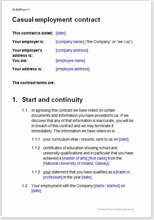 A contract, written or verbal is made as soon as the employee accepts a job offer. So as to minimise future misunderstandings, we recommend providing a written contract with the offer letter, so that the employee can return an acceptance letter with a signed copy of the contract. By law, all employees must be given a written statement of terms and conditions of employment within five days of starting work. This contract includes all the necessary information to act as a written statement so that you don’t need to provide this information separately in a letter or another document. Other employment policies and procedures not within the written statement (such as data protection) could be included in the employment contract. However, especially when you have many casual workers, changing each employee’s contract of employment (and ensuring consistency between employees) every time a new law changes can be time consuming and difficult. It is usual, therefore, to place all procedures and policies common to all staff in an employee handbook and refer to the handbook in the casual employment contract. This is the approach Net Lawman recommends.